Nannerch driveway gates shown as an unequally split pair (one gate bigger than the other) – the more usual 50/50 split gates is also available. 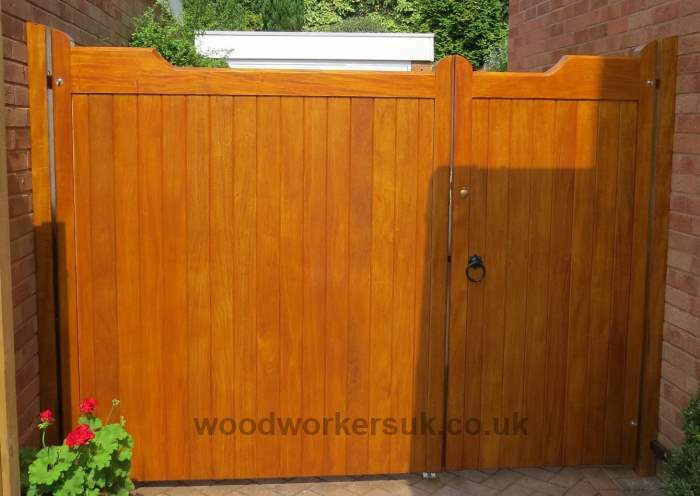 Shown in stained (an Oak stain) Idigbo (Hardwood), our Nannerch drive gates feature a diminishing gunstock head which reduces down from the tallest point by 2 3/4″ (70mm). 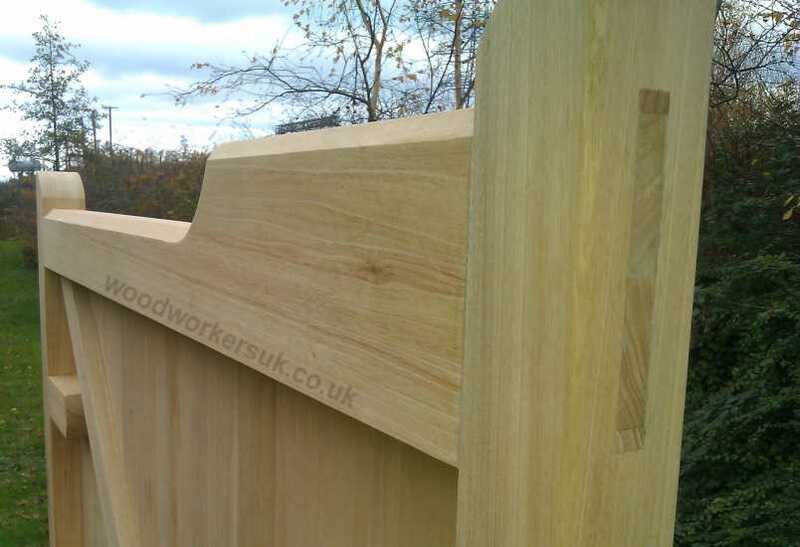 Also available made to measure in European Oak, Meranti (all Hardwoods) as well as the Idigbo shown and Accoya (Acetylated Softwood) and Unsorted Scandinavian Redwood (Softwood) – the Nannerch is ideal if you want a gate for privacy but want a simple bit of shape at the top of the gates! As well as the drive gates pictured, our Nannerch gates are also available as a pedestrian gate meaning you can have a complete matching set of drive gates and pedestrian gates to complete the look! The Nannerch gates pictured have been customised and are an ‘unequally split’ pair (i.e. one gate is bigger than the other), the traditionally split 50/50 split (each gate being the same size) are also available – please contact us with your requirements. 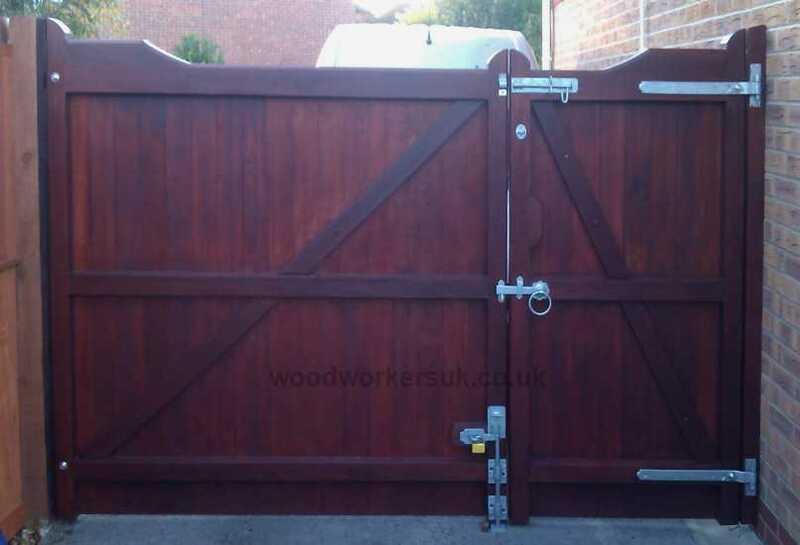 Want a bigger or smaller pair of gates than what is pictured? No problem, as with every pair of drive gates pictured on our website the Nannerch drive gates are made to suit your own drive – however unusual the sizes, give us a call or email for a full personalised costing! Have we a pedestrian gate to match? You bet! All top edges on any horizontal rails of the Nannerch feature an angled water run off, this stops the build up of moisture on your gates and makes for a longer lifespan. The stiles of the Nannerch (vertical outer uprights of the gate frame) also have rounded outer edges. The Nannerch guide prices are based on a pair of gates 6ft high x 6ft overall wide (approx 1830mm high x 1830mm overall wide) equally split gates, these are NOT from prices, smaller gates will be more economical etc – contact us for a price! All prices are correct time of insertion and are EX VAT. Free delivery to most parts of the UK mainland is included – exclusions do apply, again please contact us. To get a personalised costing on our Nannerch driveway gates please use the form below. Require delivery of your gates? Please leave the Postcode or County of the delivery address below. Do you intend to automate your gates?